Can Labour de-toxify the anti-Semitism row? 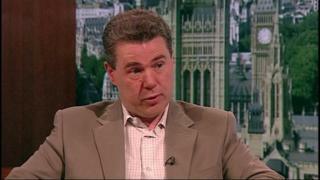 Mr Serwotka is general secretary of the largest civil service trade union, the Public and Commercial Services Union, a post he has held since December 2000. He was re-elected in 2005, 2009 and 2014. In 2015 he was among people banned from voting in Labour’s leadership election on the grounds they did not share the party’s “aims and values” – new rules had allowed non-members to vote as “registered supporters”. In 2016, he rejoined the Labour Party after 25 years, saying Jeremy Corbyn’s leadership offered a “genuine break from the past”. On Wednesday it was announced that had been elected TUC president for the coming year. Labour has been dealing with a row about the extent of anti-Semitism within the party for more than two years. A 2016 inquiry, carried out by Shami Chakrabarti, concluded that while the Labour Party was not overrun by anti-Semitism, there was an “occasionally toxic atmosphere”. But the row over the way the leadership has handled anti-Semitism allegations continued and dominated media coverage of the party over the summer. There was much controversy over a new code of conduct the party adopted on anti-Semitism, amid criticism it did not go as far as the International Holocaust Remembrance Alliance’s guidelines. Veteran MP Frank Field quit the party’s parliamentary group in August, saying the leadership was becoming a “force for anti-Semitism in British politics”. He has stressed that people who hold anti-Semitic views “have no place in the Labour Party” and said people who use “anti-Semitic poison” are not his supporters, nor do they speak for him or the party.